I've just wrapped up v0.2 of WebGLU. I'm working on updating the full documentation, I hope to be done with it later today, or some time tomorrow. v0.2 is already in the SVN repository on WebGLU's SourceForge project page, or you can just download it directly. To see how useful WebGLU can be, check out my 50 line demo. I need feedback. If you want to do something with WebGL and WebGLU can't help, or using it hurts performance, please let me know! 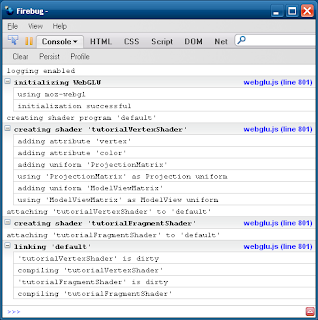 Added logging callbacks for Firebug, example output below. WGLUShader.getGLShader() [re]compiles the shader if needed, then returns the WebGL shader object usable in WebGL calls. Automatically tracks and manages its link status and the compile status of all attached shaders, [re]linking/compiling if needed. Keeps track of its shader's attributes, including their name, location from getAttribLocation, length, and a buffer. Keeps track of its shader's uniforms, including their name, and action to perform per object. Keeps track of the shader program to use when rendering. WGLUObject.setElements(elementArray) switches the object to using drawElements instead of drawArrays. Call WGLUObject.setElements(false) to switch back. Well, that's the biggest stuff anyway, there's tons of little things though. As promised, here's some logging output. It’d be much more useful if you avoided using Mozilla-specific ECMAScript extensions. Then it’d be much more likely to work in WebKit too. @bdash, I only realized that what I was using was Mozilla-specific today for two reasons. So, I went though the code a few hours ago and converted some stuff, I think I got it all. However if you think I missed something I'd really appreciate it if you filed a bug report. @bdash, thanks, bookmarked a copy and will go over it later. Maybe run your code through "JSLint" too? Well, v0.1 went through JSLint, haven't put v0.2 through, thanks for the reminder. A WebGL / WebGLU Demo in 50 Lines! WebGL, What is it and How Can I Use it? More WebGL progress, now with video!